Since Lymbyc Systym‘s outset in 2001, Brooklyn-based brothers Jared and Michael Bell have forged electro-acoustic post-rock arrangements that have successfully integrated influences from and comparisons to the likes of Four Tet, Explosions in the Sky, and Tortoise. Their tumbling, colorful sonic landscapes are generated by a combination of vintage keyboards, infectious melodies, analog effects, dynamic drumming, and intricate laptop programming. Their sound, shaped by a collaborative history dating to their preteens, has matured to impressively cinematic scores and stunning live performances that have earned the band opening slots for some of indie’s most high-profile acts including Crystal Castles, Broken Social Scene, and Blonde Redhead. Lymbyc Systym‘s latest effort and second full-length, Shutter Release (Mush/&, 2009) is “filled with memorable songs that build from their arrangements into hummable, delicate slices of electronic twee”. (XLR8R) The album’s increased sonic depth, care of Explosions in the Sky producer John Congleton, etches ethereal electronics alongside lush instrumentation laden with dense, heavily-textured melodies that appeals with a surprising pop sensibility. Anchored by drums, and ornamented with a flurry of toms alongside sparse, echoing guitars and glockenspiel, Shutter Release fleshes out arresting instrumentation; each track proving dynamic in range and leaving listeners to shift through a beautiful catalogue of smartly ornamented sound, stunning in its beauty and clarity. The band brings their live act to Asia from June to July, following an appearance at the Free Press Festival where they will be performing alongside The Flaming Lips, Stars and Ra Ra Riot. 2001년에 Lymbyc System을 결성한 이래, Jared 과 Michael Bell 두 형제는 Four Tet, Explosions in the Sky, Tortoise과 같은 아티스트들로부터 받은 영감을 짜임새 있는 일렉트로-어쿠스틱 포스트락 사운드로 구성해 왔다. 그들의 빈티지 키보드, 전염성 강한 멜로디, 아날로그 감성의 이펙트, 다이나믹한 드럼, 섬세한 프로그래밍 의 어울림은 가슴을 울리는 소리로 장관을 이룬다. 그들의 사운드는 그들은 유년기의 여러 경험에 바탕을 두었으며, 마치 한편의 영화를 본 것 같은 깊은 인상을 준다. 그들은 이러한 사운드에 더불어 출중한 라이브 실력까지 갖춘 밴드로 성장하여 Crystal Castles, Broken Social Scene, Blonde Redhead와 같은 유려한 인디밴드 들의 오프닝을 해왔다. 그들의 최신작인 두 번째 정규앨범 Shutter Release (2009)는 “쉽게 흥얼거릴 수 있는 귀여운 전자음들과 미묘한 조합들로 완성된 인상 깊은 곡들로 채워져 있다”. (XLR8R) 또한 앨범은 Explosions in the Sky의 프로듀서 John Congleton과의 작업으로 소리에 깊이 감이 더해졌고, 이는 풍성한 악기구성과 잘 짜인 멜로디로 팝적인 섬세한 감수성을 만족시키면서도 우아한 전자음을 청중의 가슴에 새긴다. 이 앨범은 탄탄한 드럼을 바탕으로 경쾌하게 연주되는 톰 소리에 희미하게 울리는 기타와 글로켄슈필의 매력적인 악기 구성을 가지고 있다. 여기에 다채로운 각각의 트랙은 청중들을 잘 꾸며진 사운드의 명료함과 아름다움에 빠지게 한다. 그들은 The Flaming Lips, Stars and Ra Ra Riot과 함께 하는 Free Press Festival을 이후로 오는 6월부터 7월까지 아시아에서 공연을 가진다. 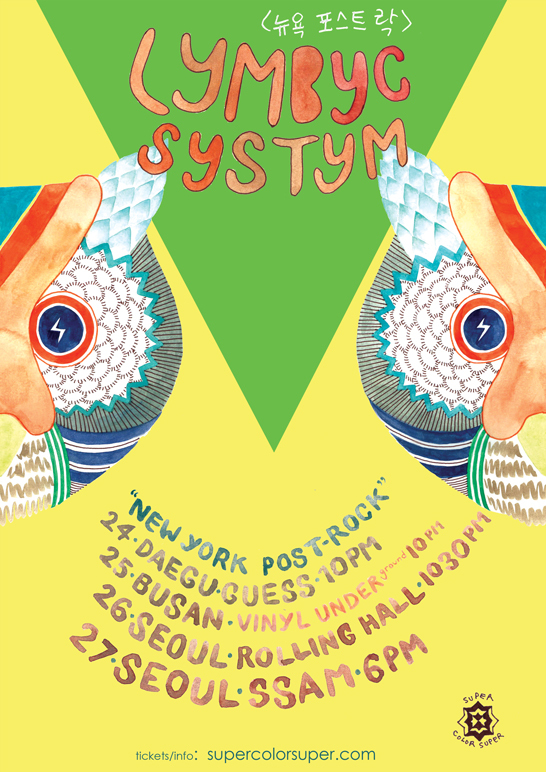 * Tickets also on sale at Hyang Records (Shinchon) and Club Bowie (Hongdae)! / 온라인 예매 외에도 향레코드, 클럽 보위에서 티켓 구매 가능합니다! i was wondering about the presale for the busan show. where do we wire the money.